A delicious and popular dish, these jerk chickens are ideal for any picnic or weekend bbq. Serve with a salad of choice. 1. Except chicken, mix all the other ingredients in a large bowl. 2. Keep aside 1/4 cup and add the chicken to the bowl. 4. Transfer to a ziplock bag and keep it in the fridge for 4 hours. 5. Remove the chicken pieces from the bag and discard any excess marinade. 6. Heat a grill pan over high flame. 7. Place the marinated chicken pieces, skin side up. 8. Grill for 10 to 12 minutes on each side (or until cooked through), brushing with the reserved marinade once or twice and turning occasionally. 8. Carefully remove from the grill and serve hot. Tip: You can also cook the chicken in a preheated oven at 350F for 25 to 30 minutes. 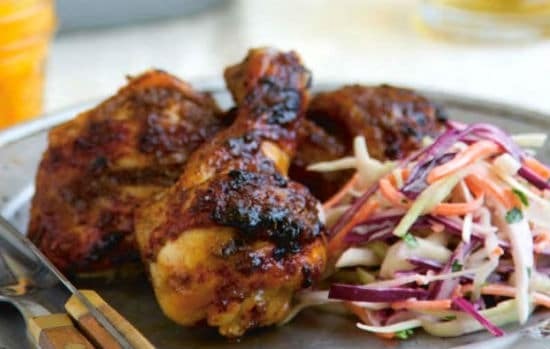 Feel free to comment or share your thoughts on this BBQ Jerk Chicken Recipe from Awesome Cuisine.